Yesterday's market saw an early decline, which fell a point shy of the first target (that's been the theme for months: downside moves have repeatedly fallen just shy of targets, often by a point or two -- which smells like a bull market). I talked about the red trend line on the charts as being the key for bulls to maintain control, and the market never traded below it (a bit to my surprise), leaving the technical picture sound for longs. From there, the market again moved up to new all-time-highs. "New all-time-highs" is a phrase that's starting to sound cliche and losing its punch, since basically every "new high" is actually a "new all-time-high" -- but outside of inventing a new language (which is beyond the scope of this article), I guess we'll all just have to keep saying it over and over, since the phrase is linguistically accurate. The big news after the close yesterday was the announcement that Janet Yellen will be marrying Brian Anscreamin, and she has decided to hyphenate her last name, so she will henceforth be known as Janet Yellen-Anscreamin. This bullish news is probably good for at least another 1000 SPX points. On a more serious note, the bulls held onto the reigns at the open yesterday, and bears were unable to reclaim the noted key trend line. Barring an immediate whipsaw, the bulls appear to have finally decisively won the battle at this inflection point. 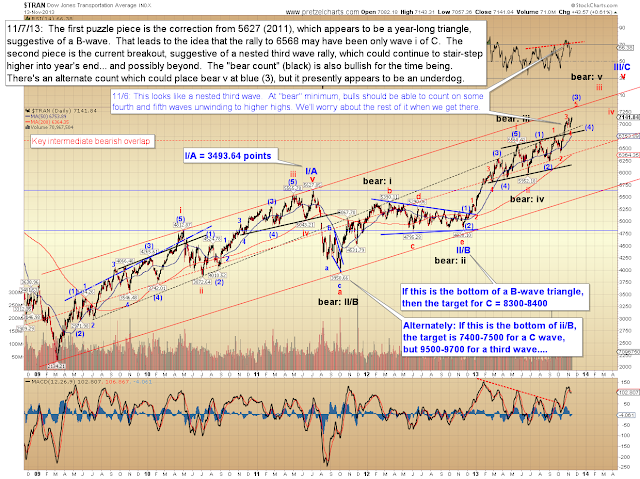 The lingering bear potential, which simply cannot be predicted as of this moment (only guarded against) is for SPX to develop into an even more complex expanded flat (noted by black "bear: (A)/(B)/(C)"). On November 6, I prepared a long-term chart of the Dow Transportation Average (TRAN) for the November 7 update, then I chickened out at the last minute and didn't publish it. I did, however promise I would publish it in an upcoming article -- so here it is (below). This chart suggests the rally is likely to stair-step higher for the time being. I've said it before, but this is my least favorite part of any wave count. Perhaps strangely, my strongest trades almost always come at the beginning of a move, before the trend has been established and when most folks still think I'm nuts. These ho-hum, let's-trade-the-endless-trend markets actually start to wear on me for some reason -- probably because I'm a contrarian by nature and hate feeling like part of the herd. So I'll admit, even though the chart looks bullish, I make for a really weak bull right here. This is not the part of the wave structure I personally like swing trading because there is still topping potential, and tops are brutal environments for swing trades -- so I'll stick to short-term trades for the moment, which feel more controlled to me. Point being, here we are many months into a well-established trend, trying to figure out exactly how many fourth waves need to unravel before we see a reversal. This can sometimes feel like trying to figure out how many angels can dance on the head of a pin (seven). As they say: the trend is your friend 'til it bites you in the rear-end (okay, the last part is mine). Moving back to the TRAN chart: I'm taking a slightly unconventional approach because I feel the wave in the middle of the chart counts best as a triangle -- which means the wave coming out of that triangle is actually where the new move (wave i) began, which then means TRAN is only now in its third wave. And this implies a series of fourth and fifth waves are still needed. There are two bear potentials which jump out at me, and the first is noted in black and still suggests higher prices. 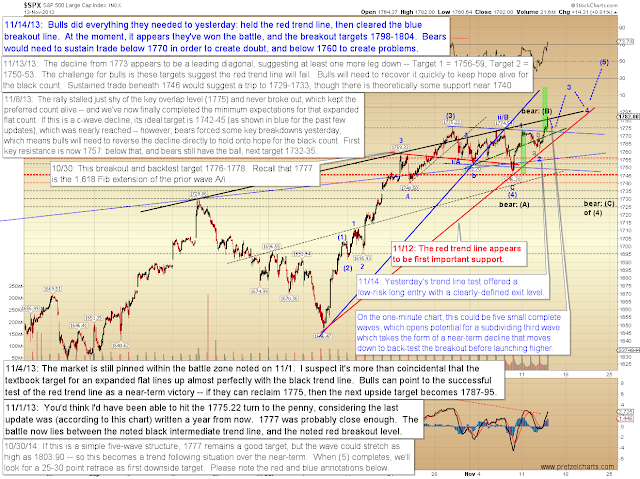 The other isn't detailed, so I'll outline that "other" bear count briefly: the only chance bears have for an immediate completion of the trend would be if the final "red 1" marks the end of an ending diagonal for "bear iii," which would then place us in the fifth and final rally wave now. That count has to be considered an underdog based on the structure of the proposed diagonal, which doesn't appear to be a series of ABC's (required for a diagonal), but instead appears to be a series of impulsive waves. This is why the counts are shown as they are, and that count is only mentioned in passing as an outlier potential. I still feel like I'm pulling my own teeth publishing this chart, but it is what it is. In conclusion, SPX appears it may move to back-test the recent breakout, but as long as that breakout holds (in other words: as of what's visible in the charts right at this moment), we really have no choice but to give bulls the benefit of the doubt until proven otherwise. Trade safe. Thinking that the Santa Claus rally should easily take the SPX to the 1850 range.